Port Adelaide has enjoyed its first win away to Sydney since 2006, winning the final three quarters of the match. The Power were more effective in their forward press, launching 50 points from forward half intercepts compared to 22 points by the Swans. Port Adelaide has registered 10 individual goal kickers compared to just seven by Sydney. This is up on the Power's 2016 average of eight individual goal kickers per game. 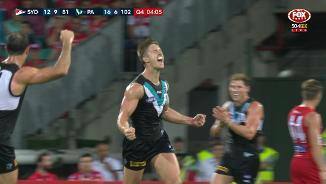 Another goal from well outside 50 metres for Port Adelaide as Hartlett finally seals the game. 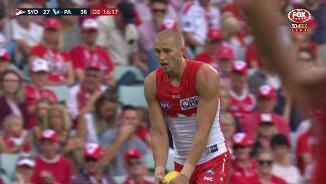 From beyond 40 metres the Power have kicked 8.2 (50), compared to 4.3 (27) by the Swans. Port Adelaide has won all four centre clearances this quarter however Sydney is doing most of the attacking. The Swans have taken the ball inside forward 50 on five more occasions but have only kicked one more goal. Lance Franklin has played a significant allround forward game. He has recorded 14 disposals, taken three marks inside forward 50 (two contested) and had six shots resulting in four goals. He has won all four one-on-one contests he has been involved in. Sydney has had the ball inside its forward half for 59 per cent of this quarter, however Port Adelaide has cashed in far more easily with five goals from just ten forward 50 entries. The Swans have kicked two majors from 16 inside 50s. Sydney has taken the ball inside forward 50 on seven more occasions than Port Adelaide this term but have scored two fewer goals. For the Swans, 12 of their entries have been launched from possessions won forward of centre, resulting in just one behind. That's two goals in a row from outside 50 metres for Port Adelaide and the Power have now kicked 12.1 (73) from their past 14 shots (with one miss). Both teams have kicked three goals from outside 50 metres across the match. From eight throwins this quarter, Port Adelaide have won six hit outs and four clearances. Three of these clearances (two to Powell-Pepper and one to Boak) have launched goals for the Power this term. The flowing play and scoring appears to have dried up following the half time break. Port Adelaide is making every post a winner under the circumstances, with ten goals from its past 11 scores. Only three of these have been from within 30 metres. For the second straight quarter, Port Adelaide has snatched a goal within the first minute. The Power has won double (12) the centre clearances of the Swans (six), led by Wines and Ebert with three apiece. Some big names in the midfield went headto-head in the second quarter amassing a lot of the ball. For Sydney, Josh Kennedy won four clearances, had nine disposals and kicked a goal and was supported by Jones (12 disposals), Parker and Jack (eight each). Meanwhile for Port Adelaide, captain Travis Boak recorded a quarterhigh 13 disposals and kicked a goal, Ollie Wines won five clearances and 11 disposals and Brad Ebert supported with another three clearances and eight disposals. This term both sides have capitalised on forward half territorial advantage. Port Adelaide has launched two goals from centre clearances and three from forward half intercepts, while Sydney has launched all four of its goals from forward of centre. Swans InterchangeDaniel Robinson and is possibly out for the game. Sydney is enjoying a dominant period with the ball in its forward half for 71 per cent of the past 12 minutes. In this time the Swans 25 kicks have been at 84 per cent efficiency compared to the Power with 15 kicks at just 47 per cent efficiency. 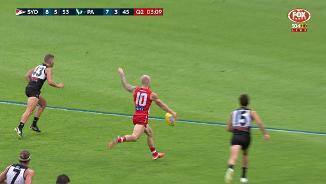 Sam Reid already has three goals in his first match since 2015, equal to his best before half time in his 99game career. The last time he did likewise was in 2015 Round 14 - also against Port Adelaide. Two goals in under two minutes for the Power to start the second term. Port Adelaide has caught Sydney napping with the first two centre clearances to Wines and Ebert quickly resulting in goals to Young and Boak. Sydney takes a onepoint lead to the first break after an entertaining quarter. Both teams enjoyed periods of dominance, with the Swans able to isolate Reid (two goals) and Franklin (one) at times, while Dixon kicked two goals for the Power. It was a relatively open quarter, with both Sydney (45 per cent) and Port Adelaide (56 per cent) able to transition the ball from endto-end. These rates are well above the 2016 league average of 21 per cent. Sam PowellPepper has become the latest to register a goal with his first kick at AFL level. The 2016 first round draft selection already has a clearance and three dispoals, along with his set shot goal from outside the 50-metre arc. Sydney has entered forward 50 on four fewer occasions than Port Adelaide however it has found the efficiency required to hit the front. The Swans have scored from 60 per cent of its forward 50 entries, well above the 2016 league average of 46 per cent. Both teams are finding the ability to transition from defensive 50 to forward 50. Sydney has done successfuly on 40 per cent of its attempts and has already launched both its goals from intercepts from defensive 50. Backto-back goals to Dixon now, with both from free kicks. Just six of his 30 goals last season came from free kicks. The Power have registered the past seven forward 50 entries of the match. In this time Port Adelaide has won four more clearances, amassed ten more kicks and also laid three more tackles than Sydney. Port Adelaide has already won three forward half intercepts, with its first goal launched from the latest to Broadbent. In 2016 the Power averaged 24.9 intercepts in its forward half per game, ranked fourth in the league. Swans InterchangeCallum Mills off due to the blood rule. After missing the entire 2016 season with various soft tissue injuries, Sam Reid has kicked the first goal of the season for the Swans. His personal best season return is 31 goals back in 2012. Port Adelaide was only able to take a mark with 17 per cent of its kicks inside 50 during the 2016 (ranked last). This ratio was matched in the 2017 JLT Community Series, however over that period it ranked the club tenth. In the 2017 JLT Community Series the Swans struggled at the stoppages, averaging 12 clearances fewer per game than its opposition (ranked 18th). They will want to improve back to 2016 levels when they averaged one more clearance per game (ranked sixth). Sydney has won 13 of the past 14 matches against Port Adelaide, including their most recent encounter by 67 points in Round 20 last season. The Power have not defeated the Swans at the SCG since 2006. Welcome to SCG for the Sydney Swans v Port Adelaide Round 1 clash. 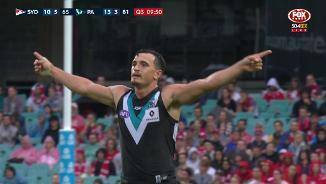 PORT Adelaide has made a huge statement in its season opener, producing a committed and skilled performance to topple last year’s grand finalist Sydney by 28 points at the SCG. The Power seized upon their opportunities throughout a high-quality contest, kicking with remarkable accuracy to beat the stunned Swans 17.8. (110) to 12.10. (82) and register their first win at the SCG in 11 years. Sporting three debutants and ruckman Paddy Ryder playing his first game since 2015, leaders Brad Ebert, Ollie Wines and Travis Boak - playing his 200th game - spurred Port to a famous win, just their second victory over Sydney in their past 15 meetings. 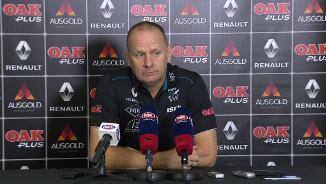 "I'm really proud that they stood up for the skipper, and you don't need milestone games to stand up, but it's pretty special for a bloke like Travis (Boak), who has over his journey made some courageous decisions to be a part of this footy club," Port Adelaide coach Ken Hinkley said. "I think he got a fair bit of payback today which is good." The teams went toe-to-toe during the first half, but Port’s tenacity in pulling back Sydney’s two big streaks - a 19-point run in the first term and 20 points in the second - hinted at their intent. Port’s gutsy four-point half-time lead, 9.3. (57) to 8.5. (53), was built on dominance in contested possession and clearances, traditional power-bases for the hosts. 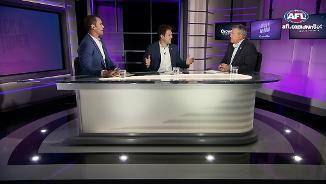 Sydney’s potent forward line - under the recent tutelage of the great Tony Lockett - continued to offer hope for the Swans, but Port would not be intimidated. Throughout the third quarter they made every post a winner. Port worked furiously in defence and punished Sydney’s mistakes to open up a 22-point lead. Light drizzle during the term made controlling the ball increasingly hard, adding to Sydney’s challenge. 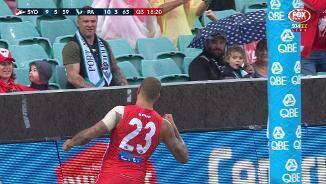 Lance Franklin’s fourth goal, in the third minute of the final quarter, offered Sydney a lifeline, but Jared Polec’s flowing left foot strike back a minute later typified Port’s combination of effort and execution. Hamish Hartlett’s goal in the 25th minute and Chad Wingard’s third two minutes later sealed a great win for Hinkley’s men. "They kicked the last two goals just before halftime and then probably after half time they got a couple of really simple ones that they shouldn’t have been able to get, through missed tackles and just basic things that we didn’t get right," Sydney coach John Longmire said. "We didn’t have a lot of players win their positions, and that includes our experienced players. Maybe some of the younger kids struggled a little bit. But we didn’t have a lot of winners the whole game, really." Sydney: 'New' might not be the most likely word to describe a player in the final year of a five-year contract. But given Sam Reid missed all of last season with a series of injuries, his towering presence must have felt like a gift for the Swans. 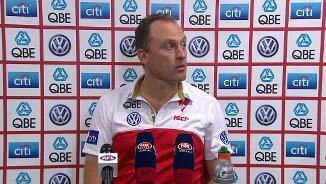 Reid delivered, providing another huge forward line option and swinging back to play a key role in defence. He kicked three, had 13 disposals and defended hard. Port Adelaide: Port had three debutants, but Sam Powell-Pepper is the one to watch. The big, strong 2016 first-round draft selection registered a goal with his first kick at AFL level, a long-range set shot from beyond the 50m arc, and another booming thump in the third term, which opened up an 81-65 lead. Powell-Pepper had 19 touches and looked right at home. Sydney: Callum Mills left the field in the opening term due to the blood rule but soon returned. Dan Robinson went off with a shoulder injury just before half-time. 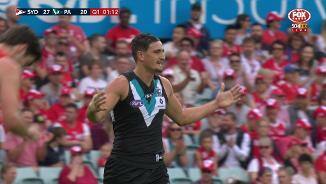 Port Adelaide: Robbie Gray was left groggy after a clash with Sydney big man Sam Naismith but returned to the action. 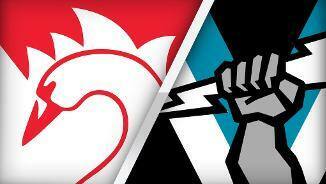 The Swans make their first trip to Melbourne and face the Western Bulldogs in a rematch of last year's Grand Final. Port Adelaide has an eight-day gap before hosting Fremantle at Adelaide Oval.